The weekly newsletter of Pastor Richard Todd from Community Grace Brethren Church in Whittier, Calif., includes an invitation to view the lights at the home of Ed and Joyce Faranda from the Whittier congregation. 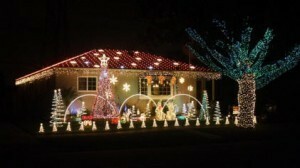 Todd says, “The lights are coordinated with the music you hear on your FM car radio. They live at 5203 Ashworth Street in Lakewood.